New Elliott 7" released on  Suicidesqueeze Records  includes Division Day/No name #6. 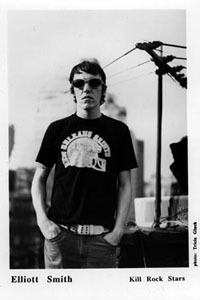 There is now an Elliott Smith Bulletin Board go on and post..
or click above and I will publish your stuff here. site maintained and created by lowercase mpriss17:mail me with questions, suggestions, and problems. This IndieRing site operated by mpriss17.